They call it the silent killer. And there’s a good chance you’re among the millions of Americans at risk of early death or debilitating disease from high blood pressure as you read this. But the good news is: You can improve your risk by as much as 38 percent. A new study called the Systolic Blood Pressure Intervention Trial, or SPRINT, just revealed that the blood pressure numbers most of us have been accepting as ‘healthy,’ are far too high. The findings are particularly important to older Americans as well as people with pre-existing heart, kidney or blood sugar problems. For people between 50 and 75 — who had symptoms associated with heart or kidney disease — the SPRINT study revealed that helping patients reach a systolic blood pressure reading (the top number) of less than 120, rather than the conventionally recommended 140 to 150 — could save lives. Reverse and prevent high blood pressure naturally [infographic]They learned that reducing systolic blood pressure to below 120 led to a 26 percent drop in death from all natural causes and a remarkable 38 percent reduction in fatal heart failure. Remember, these astounding findings were related to patients whose bodies had already been damaged by high blood pressure. But even 30 percent of otherwise healthy Americans have something called “prehypertension” — which is blood pressure numbers that are higher than normal, but under the 120/80 mark. If you’re one of these people, you run a greater risk of developing high blood pressure. Unfortunately, mainstream doctors believe the best way to lower high blood pressure is with damaging prescriptions that can have a number of unintended health consequences. These are not medications you want to be taking daily for the next several decades unless you’re a fan of dizziness, mood swings, weakness and other debilitating side effects. “Prescription drug therapy can quickly reduce your blood pressure. But it only treats your symptoms—not the root causes of why you have hypertension in the first place,” Dr. Mark Wiley, who holds a PhD in alternative medicine and is a renowned Oriental health practitioner explained. 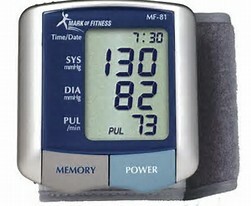 The good news is that there are several natural ways to get your blood pressure under control. For anyone trying to control blood pressure, a top recommendation is to address potential weight issues by increasing physical activity and replacing fatty, sodium-laden diet choices with fresh fruits and vegetables, healthy fats and lean protein. Even a light walk or 30-minutes of daily exercise can help bring blood pressure down. Garlic — which has long been touted for its ability to improve heart health, including lowering blood pressure. Garlic extract, found in health-food stores and online, may work best. Magnesium— a key mineral found in abundance in spinach, cashews, quinoa and kidney beans that can lower blood pressure, as well as help manage an irregular heartbeat. Omega-3 fatty acids—found in cold-water fatty fish like salmon and sardines, as well as in chia and flax seeds, walnuts and other sources, these fatty acids are key to overall good health. Another good way to keep you blood pressure under control naturally is by taking a daily nutritional supplement formulated to support cardiovascular health. Vitamin C— Studies have linked higher blood levels of vitamin C to healthy blood pressure. Researchers found that antioxidants like vitamin C help regulate blood pressure by protecting your body’s supply of nitric oxide, a molecule that relaxes your blood vessels. Vitamins B6 and B12— Deficiencies in vitamins B6 and B12 can increase your levels of an amino acid called homocysteine, which is proven to be unhealthy for your heart and circulatory system. Folic Acid— Folic acid also helps keep homocysteine levels low and improves the function of the cells lining your arteries. Niacin— This powerful B vitamin widens your blood vessels, which helps you maintain healthy blood pressure. Hibiscus Flower— This fruity-tasting flower has been found in studies to lower blood pressure as much as 12 percent when consumed daily. Olive Leaf— Decreases blood pressure by promoting widening of blood vessles throughout your body. Coleus Forskohlii— This mint-like plant helps keep blood pressure normal by slowing your pulse and strengthening your heartbeat. Green Tea— This Chinese favorite helps inhibit the angiotensin-converting enzyme (ACE) – a major cause of blood pressure worries. Hawthorn Berry Extract— This popular heart remedy helps dilate your blood vessels, decreasing the amount of resistance your blood is met with. That can boost your circulation and promote healthy blood pressure. There are many other steps you can take to get your blood pressure in check without relying on the pharmaceutical poison pushed by mainstream physicians. Dr. Wiley, who we spoke to about the dangers of conventional high blood pressure treatments for this article, literally wrote the book on reducing hypertension naturally.